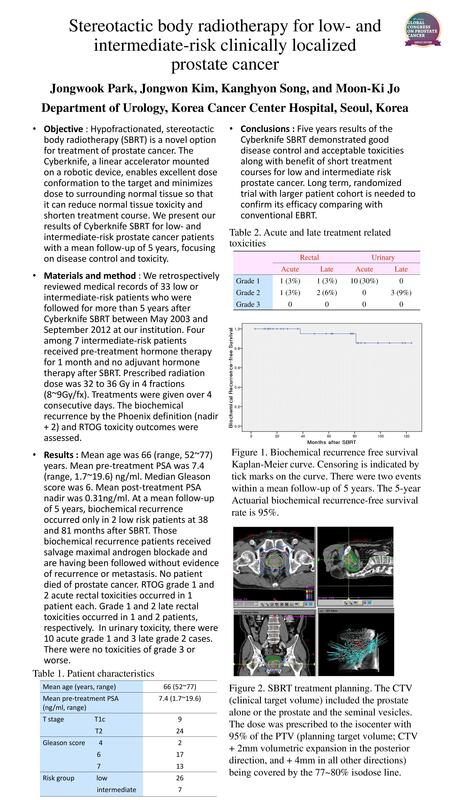 Objective : Hypofractionated, stereotactic body radiotherapy (SBRT) is a novel option for treatment of prostate cancer. The Cyberknife, a linear accelerator mounted on a robotic device, enables excellent dose conformation to the target and minimizes dose to surrounding normal tissue so that it can reduce normal tissue toxicity and shorten treatment course. We present our results of Cyberknife SBRT for low- and intermediate-risk prostate cancer patients with a mean follow-up of 5 years, focusing on disease control and toxicity. Materials and method : We retrospectively reviewed medical records of 33 low or intermediate-risk patients who were followed for more than 5 years after Cyberknife SBRT between May 2003 and September 2012 at our institution. Four among 6 intermediate-risk patients received pre-treatment hormone therapy for 1 or 2 months and no adjuvant hormone therapy after SBRT. Prescribed radiation dose was 32 to 36 Gy in 4 fractions. The biochemical recurrence by the Phoenix definition and RTOG toxicity outcomes were assessed. Results : Mean age was 66 (range, 52~77) years. Mean pre-treatment PSA was 7.4 (range, 1.7~19.6) ng/ml. Median Gleason score was 6. Mean post-treatment PSA nadir was 0.31ng/ml. At a mean follow-up of 5 years, biochemical recurrence occurred only in 2 patients at 38 and 81 months after SBRT. Those patients received salvage maximal androgen blockade and are having been followed without evidence of recurrence or metastasis until now. No patient died of prostate cancer. RTOG grade 1, 2, and 3 rectal toxicities occurred in 1, 2, and 1 patients, respectively. RTOG grade 1, 2, and 3 urinary toxicities occurred in 12, 3, and 1 patients, respectively. There were no severe toxicities of grade 4 or worse. Conclusions : The SBRT with Cyberknife could be a feasible treatment option for low and intermediate risk prostate cancer. Long term, randomized trial with larger patient cohort is needed to confirm its efficacy.